As many of us will be going on or summer holidays soon I wanted to share with you some World of Duty Free exclusives you can pick up before you travel. I'm one of those people that love airports, I love having a few hours to mooch around the various beauty counters picking up some tax free make-up and generally just perusing endless perfumes, make up and skincare prodcuts. The first is the Hawaii OPI set which contains 6 miniature polishes in really summery shades. I love the bright orange shade called Go with the Lava Flow as I think this will look so beautiful on tanned toes covered in sand. 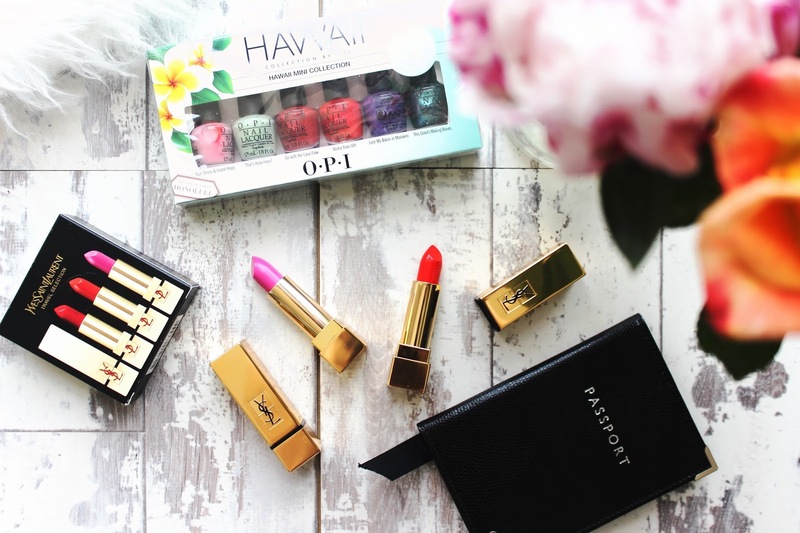 The second set that I love is the stunning trio lipstick set from YSL. The set contains 3 full sized Rouge Pur Couture Lipsticks in the shades- No.1 Le Rouge a super bright red, No.13 Le Orange a stunning, bright orange coral shade and No.27 Fuchsia Innocent, a vibrant pink. I couldn't think of a better lipstick set to buy for a summer holiday as all 3 shades are so bright and would look beautiful with a tan. I think my favourite shade from the set is Le Orange because I think it's a shade that anyone could pull off. Normally these cost £26 and this trio costs £59.35, which is pricey but good value for money for 3 YSL lipsticks. They have a moisturising satin finish and apply really beautifully on the lips. Are you planning any holidays this summer? I'd love to know what you pick up from World of Duty Free.